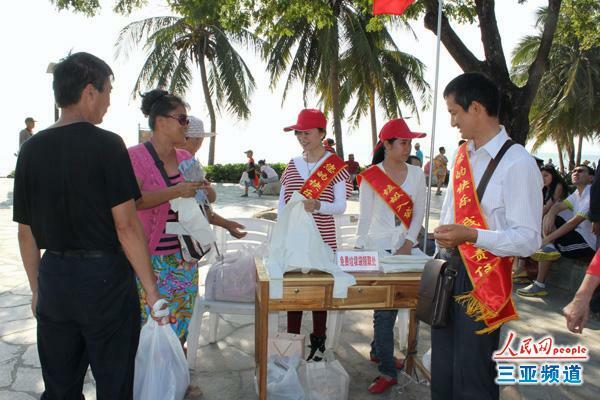 On Feb.11, the 2nd day of the Chinese New Year, Sanya volunteers were handing out green garbage bags to residents and tourists to try and reduce littering at Haiyue Square in Sanya Bay in the hot sun all day. A volunteer said that all of them joined this environmental action spontaneously, which was organized by Sanya Environmental Protection Bureau, it aims to improve everybody’s environmental protection consciousness. Besides, they have placed garbage bins every 100 meters at beaches to help raise public environmental protection. According to Mr.Wang, a section chief of Sanya Environmental Protection Bureau , there are 4 green garbage bags handout stations along Sanya Bay, and 3 stations at Dadonghai Square, Nanshan Temple and Yalong Bay Tropical Paradise Forest Park, and 100 volunteers and some tourists have took part in this activity.